On the 8th of January, I excitedly purchased the Tefal Gv8431 Pro Express Auto Clean Steam Generator iron. I was really excited. When I bought it it was over £150. It wasn’t an impulse purchase, £150 for an iron is a lot of money for an iron, steam or otherwise. But there were so many positive reviews, that I thought that all these people couldn’t be wrong about an investment iron, could they? For the first three months, it worked like a dream. It cut my ironing time by about 40%! I was ironing like an ironing fiend. I was the Jenson Button of ironing. The iron itself was light and easy to maneuver which was a bonus for me and my carpal tunnelly hands. Then around about the fourth month, it started making a strange clicky sound. I thought it was because I’d let the reservoir go empty (I hadn’t!). But I thought maybe it was just because it was refilling the steam reservoir, or cleaning itself, or regulating the temperature. Because, surely, it wasn’t going to conk out on me! Then about a month ago, the non-stick sole plate started sticking. It started burning shirts and trousers. What was worse was that it was transferring the burnt bits onto clothing that I was ironing. I found myself having to painstakingly remove the burnt on bits from the sole plates EACH time I had to use the iron. I had to even pause in between ironing sessions, have an ironing intermission if you will, so that I could let the sole plate cool so that I could make sure there weren’t burnt on bits and I could remove any burnt on bits. And before you ask, I was ironing clothes at the right temperature setting. I pride myself on knowing how to use a steam iron. I thought that buying an expensive iron meant I was protecting my clothes, that I was making sure I was using a good product that would ensure that the ironing experience wouldn’t be such a chore, because, let’s face it, it is a chore. Six months into using this expensive piece of ironing kit, I am beginning to believe I was duped into parting with my money. 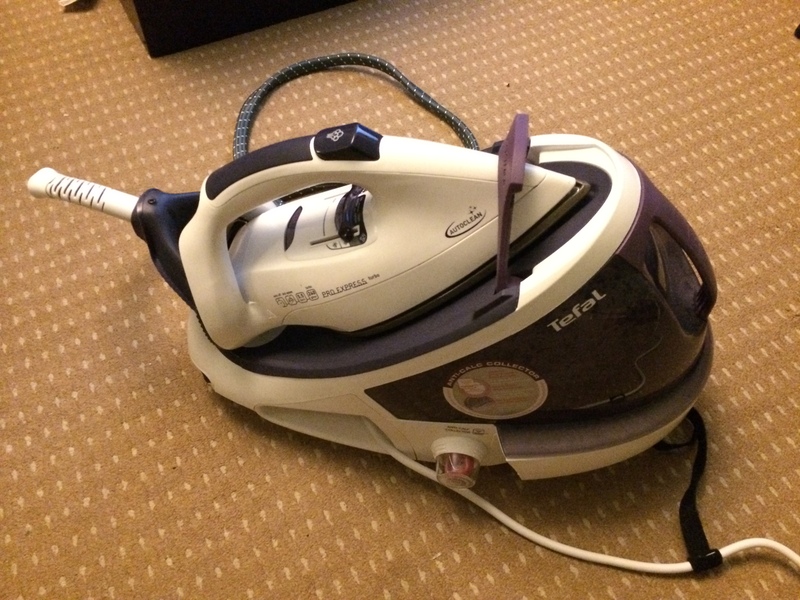 Tefal claims it to be a top spec steam generator iron. It claims that you are able to glide through stubborn creases. And it’s true, you do glide through stubborn creases, like a dream, I might add. For about 6 months. Then gliding stops, the burnings starts, the ruining of the clothes begin and the nightmare is never-ending. I don’t have the box to return the iron. I only have the manual and, of course, the iron. I’d like to return it, but I’m not sure I’m going to be able to. To say that I am annoyed it an understatement. I am unable to iron my work clothes for tomorrow. I have wrinkly clothes. I have this expensive clunky thing in my house that should solve my wrinkly clothes problem. But instead I am afraid to use it because it will burn my clothes. For all its wonderful promises, Tefal has over-promised and under-delivered and has majorly disappointed.